Beachside Gardens of Deerfield Beach, Florida is a small, private resort located 1/2 block from the beautiful Atlantic Ocean. Modern one-bedroom or efficiency apartments are available to rent on a weekly or monthly vacation rental basis. There is a lovely, tropical pool and patio area with a barbecue pit, picnic area and sun deck. The apartments are fully equipped with everything from linens to dishes, color cable television and comfortable furnishings. Rates are $89 per day from January through March. Off season rates are also available at $37 per day. Tax is additional. For further information or special seasonal package rates, please call. Payment methods include cash, personal check, travelers check, money order. Directions: Take 1-95 to Hillsboro Boulevard exit. Head east on Hillsboro to A-1 -A. Go North (left) onto A-1 -A to NE 4 Court. Make left. Beachside Gardens will be on your right. This and other Fort Lauderdale Bed and Breakfast Inns can be found here in The Register. 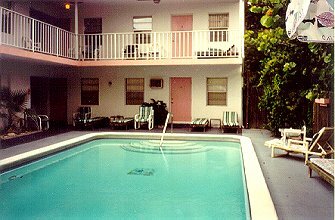 Romantic Country Inns, Getaways and B&Bs offer a great Ft. Lauderdale lodging alternative to big hotels.